The winning numbers, reading from left to right, across the columns: 100 – 21 – 53. Congratulations to the winners! Each of you will receive a copy of: A Little History: Photographs of Nick Cave & Cohorts 1981-2013 by Bleddyn Butcher. I will email each of the winners to confirm, and will then forward your names and mailing addresses, along with your entry forms, to Clare Drysdale at Allen & Unwin’s London office. She will organize the rest. Thanks for participating, everyone! It was fun to host this giveaway. 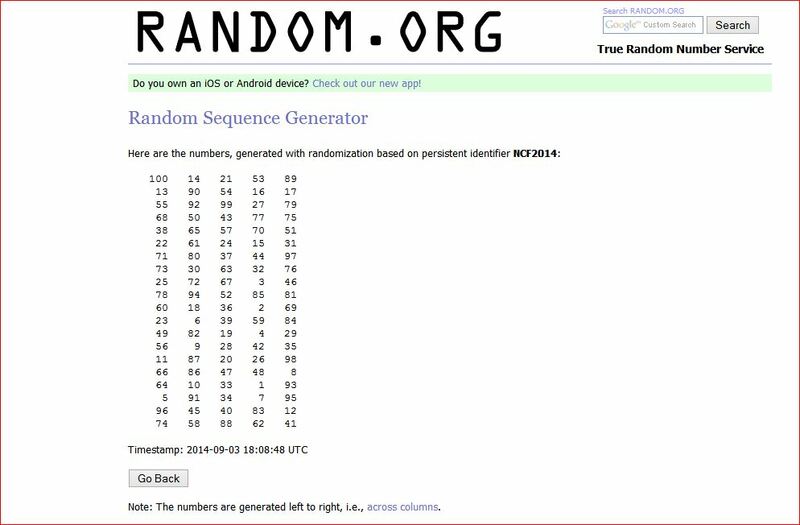 Here is the random number sequence generated on Sep 3, 2014. Click for larger view. Australian photographer Bleddyn Butcher has spent more than thirty years chronicling a legend. Nick himself describes Bleddyn’s photos as ‘the props around which my memories collect.’ It’s understandable, considering Bleddyn’s uncanny timing, as when Bob Dylan showed up at Nick’s trailer at Glastonbury. Over the years, Bleddyn Butcher has made his bones as the quintessential Cave documentarian. He has produced the most iconic images of Nick Cave ever photographed, the best of which are assembled in A Little History: Photographs of Nick Cave & Cohorts 1981-2013. A LITTLE HISTORY is a stunning collection of 100 photographs. The jacket cover photo is a well-chosen portrait of Nick during ‘The Singer’ period. The flip side of the jacket reveals a hidden poster of Nick, in his Maynard guise. And that’s just for starters. A LITTLE HISTORY will be equally prized by Cave aficionados and those who appreciate fine photography. It is the perfect coffee table book for Autumn 2014 and X-mas gifting. In stock now at Amazon.uk. Review by Morgan Wolfe for Nick Cave Fixes blog, September 4, 2014. 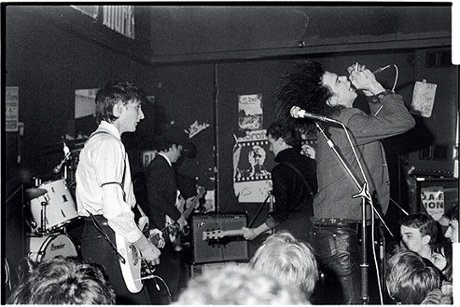 View Nick Cave’s career in pictures , a set of Bleddyn Butcher’s iconic images. Below, The Birthday Party performimg at The Moonlight Club, North London. October 1981. ‘The band was an unruly beast, champing at every bit, straining at every leash.